Old ways of understanding competition and media economics are as outdated as a black-and-white television in today’’’s ever-changing telecommunications industry. Sylvia Chan-Olmsted, a prominent communications scholar, is working to develop new models to help understand this profoundly altered landscape. Chan-Olmsted says technological innovations and changing structures in media ownership have revolutionized the telecommunications landscape. Traditionally, a finite broadcast spectrum limited the number of broadcasters, and Federal regulation limited media ownership. But with technology innovations, such as fiber optics, came enormous change. Media companies now can provide 500 channels of programming and content no longer has to appeal just to a general audience. As the nature of the media changed, media ownership also changed. With the help of deregulation, industries that used to be distinct – telephone, mass media, consumer electronics, and computing -have merged into an international information industry, Chan-Olmsted says. By melding strategic management theories and media industry studies, Chan-Olmstead has initiated a new way of studying media economics. As part of her work, she has proposed two theoretical frameworks for looking at the cable television market and the broadband television industry. 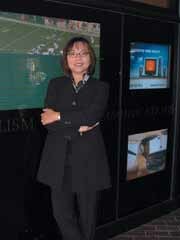 She also is the editor of an important book in the field, Global Media Economics. In addition to her work in media competition, Chan-Olmsted is a recognized expert in media brand management which looks at how media companies are perceived by consumers. In some of her most recent work, she has found that the public perceives PBS as being “””enlightening, informative, intelligent,” with “quality” and “trustworthy” being the characteristics most associated with the brand. Despite increasing competition from cable channels, the positive PBS brand perception has not been diluted, she found. Her work has been funded by the National Association of Broadcasters and the Magness Institute at the Cable Center.